premium amortization, discount accretion software. premium and discount amortization software for a PC or network sharing system. Subsidiary premium and discount balances, book value reports with detail and subtotals by general ledger account number. Journal vouchers with debit and credit column amounts. Allocation: Available with an option to distribute monthly income and expense for all or selected records to multiple revenue, cost center general ledger accounts. Import client bonds, calculate for desired period, export monthly and yearly reports. Investment classifications, user defined group totals, with or without general ledger module. Annual restatement, due diligence results for prior years, other periods. 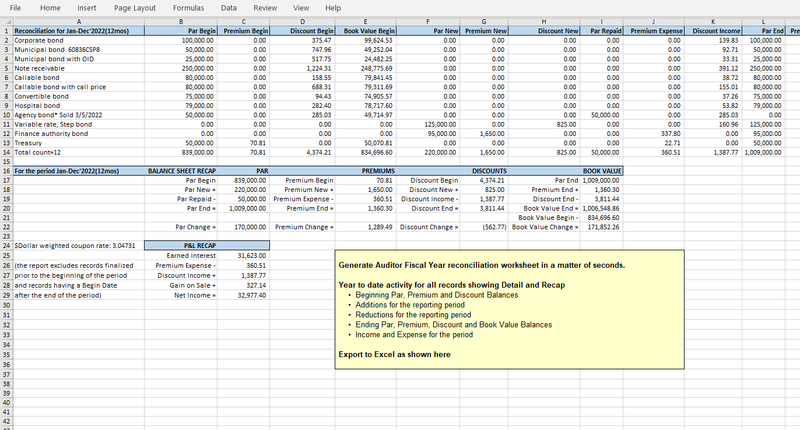 Calculate current and projected portfolio value "as of" any future month, entire years. Portfolio amortization, accretion reports with premium, discount and cost basis balances for you and your accountant. Prior periods. Current. Future projections. Group bonds and investments. Obtain subtotals by any category. 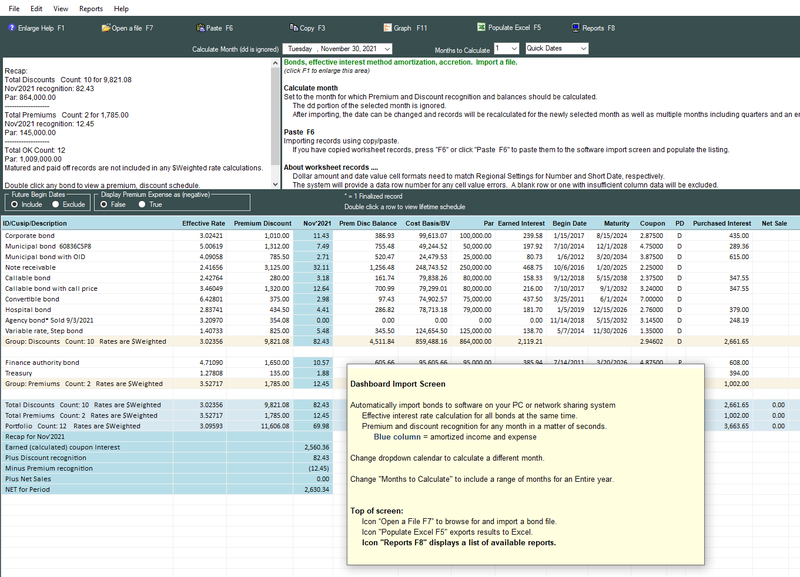 Maintain bonds and investments in more than one worksheet. Import and calculate one worksheet. Import and calculate some or all worksheets. Month-by-month recognition schedule for each bond. Annual subtotals. What would happen if I sold an existing bond today? Should I buy this new bond? Export, archive results using easy to create Excel and Adobe pdf files. Income and expense, remaining balance, book value (cost basis), earned interest for each and totals for all records in a matter of seconds. Another view of the Import screen, primarily so you can sort records by desired values, such as Coupon rate, Maturity date and more. Premium, Discount recognition report. Includes Journal Voucher and General Ledger Posting file. Typically for General Ledger Business Version. Premium amortization and discount accretion will be recognized for the selected calendar calculation month. Records will be sorted by the values in spreadsheet column U general ledger accounts. Totals will be provided for each account. Totals will be grouped within Discount and Premium categories. A Journal Voucher and General Ledger posting file will also be created. For non-business purposes, spreadsheet column U values can be used to generate subtotals for other purposes dealing with premiums and discounts. CASH interest +/- Discount, Premium amortization +/- Net Gain on sale. Cash coupon interest received during the report period (the calendar month or number of months) plus Discount recognition and minus Premium recognition. The result is NET earnings for the period based on coupon cash receipts. Net Gain or Loss for All records which have matured or otherwise ended their term. All records which have reached Maturity date, Call date, have been Sold, Paid Down to zero, Redeemed in full or otherwise finished their term. Report consists of Net Gain or Loss based on spreadsheet column M, Gain/Loss on sale and/or column O, Sale Proceeds. This report can also be used as a purge list when beginning a new year. Create a new spreadsheet with a file name dated for the new year. Delete records appearing on this report through the prior year end. Records will appear in the order they appear in the spreadsheet in order to facilitate the above. CASH and coupon interest due represent interest from one coupon payment date to the next. Actual cash activity and dates need not be logged (see the following regarding differences between calculated earned and cash interest receipts). The system "moves" spreadsheet column R Payment Due date, along with a prior due/accrue from date, forward and backward based on the calendar calculation month. EARNED interest is the amount to which you are entitled, typically representing full month periods but also spanning the entire life of the record. Interest is always being earned regardless of whether or not interest is received as cash (whether it be cash, check, direct deposit and otherwise). Think of Earned Interest as having a job where you get paid on Friday. Come Thursday evening, you have earned 4 days worth of your pay even though you won't get the cash until Friday. 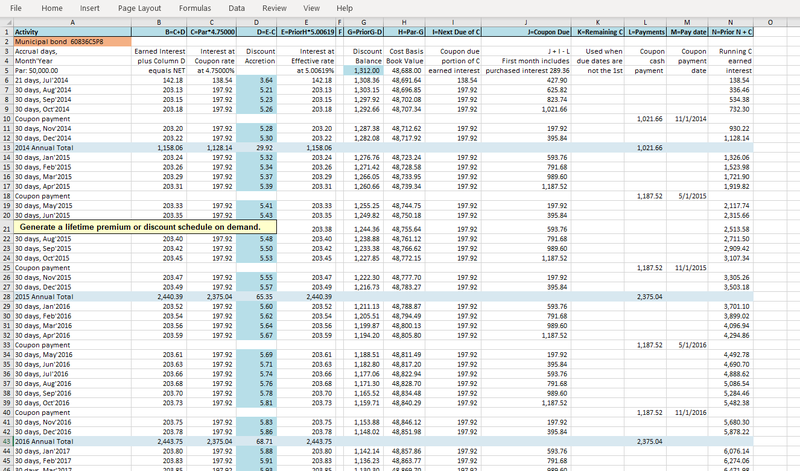 This system calculates all interest based on spreadsheet values as they exist when imported. No calculations, report values or other results are ever saved from one import to another. Penny differences will likely arise between actual cash received and what is calculated by the system. Substantial differences may need to be investigated. Furthermore, coupon interest calculations in this software should never be used for tax or other reporting purposes. Instead, obtain and use the figures provided by the entity responsible for coupon payment disbursements. EARNED interest +/- Discount, Premium amortization +/- Net Gain on sale. Earned interest for the report period (the calendar month or number of months) plus Discount recognition and minus Premium recognition. The result is NET earnings for the period. 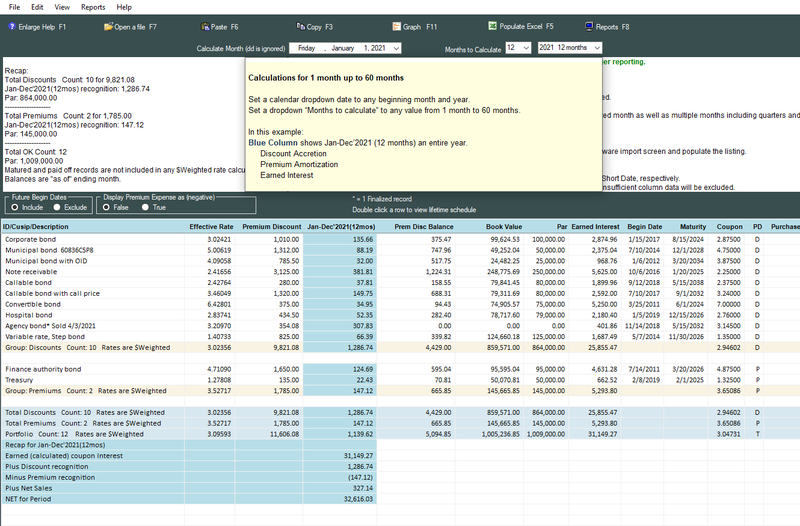 The system "moves" spreadsheet column R Payment Due date, along with Accrue From date, forward and backward based on the calendar calculation month. Actual cash activity and dates need not be logged. Simply enter any Coupon due date and frequency for the system to adjust as needed. All coupon interest due since previous payment minus Cash Due this month. Requires values in spreadsheet columns R and S (if columns R and S are blank, records will be flagged as missing required values). The system determines the amount of coupon interest earned through this month including cash interest due. This furnishes everything earned and due since prior coupon payment dates. Records will be sorted by the values in spreadsheet column T general ledger accounts. Totals will be provided for each value in spreadsheet column T.
The report consists of records with a Begin Date equal to or earlier than the calendar month. Coupon interest payments plus any par reductions, sales, maturities occurring this month. Requires values in spreadsheet columns R and S (otherwise, records will be flagged as missing required values) . The report includes records having a coupon payment due date matching the selected calendar calculation month. The report will also include interest plus Par for records with a Maturity date, Sale date or other finalized reason date falling within the calendar month. Also included are any Net gain for sold bonds as well as Par for reductions to Par for the month. Subtotals are provided based on values in spreadsheet column T.
The report can be printed and/or exported to Excel or another spreadsheet, enabling you to "tick off" cash receivables as they come in (it is not necessary to update the system with cash receipts). Records with a Begin Date later than the calendar month will be excluded. Records which have finalized, such as matured or called, in months PRIOR to the calendar month will be excluded. What was Earned this month. Includes Journal Voucher and General Ledger Posting File. Requires values in spreadsheet columns R, S and T (if columns R and S are blank, records will be flagged as missing required values). Typically for business (running this report is optional and not required for the system to operate). The system determines the amount of coupon interest to accrue for the selected calendar calculation month. Also provides a "Total Accrued" which includes applicable Purchased Interest for balancing to receivable accounts. Records will be sorted by the values in spreadsheet column T general ledger accounts. Totals will be provided for each account. A Journal Voucher and General Ledger posting file will also be created. The report consists of records with a Begin Date equal to or earlier than the calendar month. Records which have finalized, such as matured or called, in or prior to the calendar month will be excluded. RECONCILING RECEIVABLE ACCOUNTS: The Accrued Interest Report provides a subsidiary listing for general ledger receivable accounts. CASH INTEREST RECEIVED: Interest receipts can be posted directly to income. The Accrued Interest report and Accrued Interest Reversal report (below) eliminate the need to reconcile cash receipts to receivable accounts each month. Reverse accruals for Cash Due that has been received. Includes Journal Voucher and General Ledger Posting File. Requires values in spreadsheet columns R, S and T (if columns R and S are blank, records will not appear on this report). The system determines the amount of accrued interest to reverse for the selected calendar calculation month. Prior month accruals are NOT being reversed. Reversals are created ONLY for records having a coupon payment due plus Matured, Called, Sold and records which Paid off in the selected reversal month. Reversal amount consists of accrued interest previously posted by the system for these records for ALL months, including Purchased Interest posted by you. The system calculates running accrual for bonds through the preceding month to determine the amount to reverse (bonds with accrued interest should not be deleted from the spreadsheet until reversals have been done). Records will be sorted by the values in spreadsheet column T general ledger accounts. Totals will be provided for each account. A Journal Voucher and General Ledger posting file will also be created. The report consists of records with a Begin Date equal to or earlier than the calendar month. Records must also have a Coupon Due date in spreadsheet column R and a column S code greater than 0. Records which have finalized, such as matured or called, in months PRIOR to the calendar month will be excluded. Report 10: Reconciliation Report for any month or annual period - Beginning balances plus activity for the period. Balances at the beginning of the desired period, plus additions for new records during the period, minus activity equals ending balances. Primarily used for reconciling changes to Balance Sheet accounts. Report 11: Market Position Quote report. Compare Market Quote to Cost Basis calculated as of calendar 'dd' day. The system will compare a Market Quote for a bond to the Cost Basis calculated as of (TO) the 'dd' date portion of the calendar date. Premiums and discounts are not recognized for the 'dd' date. Determine your portfolio position for each bond, with a total for all bonds. We can calculate a bond file on a one-time basis. Premium and discount amortization for a month. This program has just made my life so much easier. I can finally stop adding up all of my amortization schedules! We installed your software and just used it for the first time. I can't believe how much work it will save us each month. What used to take hours is now done in a matter of minutes. Your product performs exactly as advertised! Our outside accountants just completed their audit. This is the first year we've been using your software AND the first year we received a clean audit report. I'm a partner in a small CPA firm. We were recently engaged to audit municipal bonds issued by a local agency. Bond discounts needed to be recalculated using the effective interest method. Calculations with annual reports had to be provided for each of the past seven years. I can't believe how easily your software allowed us to finish the entire job in such a short period of time. Many thanks for the excellent help and support. I was really not expecting feedback so quickly. Special project? Pressed for time? Many clients "save as" and create a new file each year, and then delete matured and sold bonds from the new file. Accounting services firm? Financial advisor? Do you prepare amortization reports for another party? 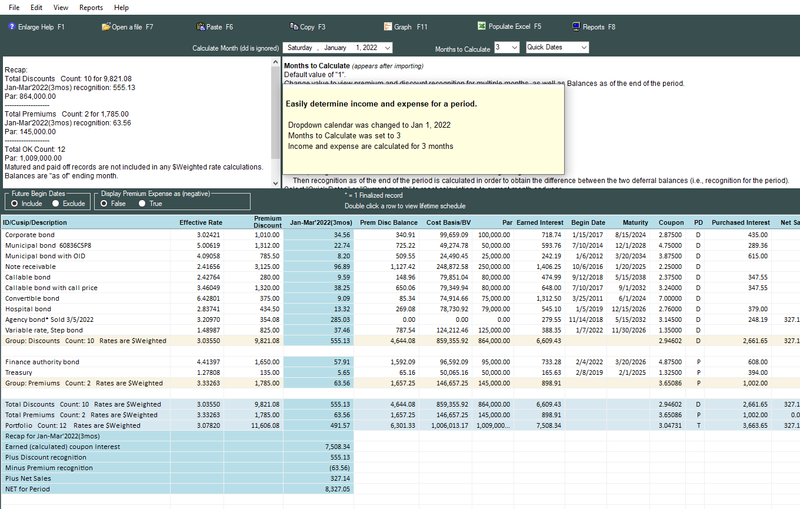 An Excel file and worksheet template come with the software. • View reports. Print reports. Automatically generate a lifetime premium or discount recognition schedule for any bond at any time. View. Print. Save in Adobe. Save in Excel. Recognize premiums and discounts for a span of 2 months through 12 months. Preserve your existing cost basis book values. No restatement or adjusting journal entries necessary. The software can begin amortizing current premium and discount balances. "Thank you! This program has just made my life so much easier. I can finally stop adding up all of my amortization schedules!" Calculate prior and current cost basis book values. Amortize all bonds at the same time. Get monthly, yearly totals in a few seconds. Typically the beginning of a calendar or fiscal year using balances at year end. "We installed your software and just used it for the first time. I can't believe how much work it will save us each month. What used to take hours is now done in a matter of minutes. Your product performs exactly as advertised!" I can finally stop adding up all of my amortization schedules! We installed your software and just used it for the first time. Your product performs exactly as advertised! the first year we received a clean audit report. We were recently engaged to audit municipal bonds issued by a local agency. Bond discounts needed to be recalculated using the effective interest method. Calculations with annual reports had to be provided for each of the past seven years. I can't believe how easily your software allowed us to finish the entire job in such a short period of time. Many thanks for the excellent help and support. I was really not expecting feedback so quickly. and obtain a free demo. Premium and discount amortization for a month. For an entire calendar/fiscal year. The software does everything else. • Premium, discount recognition. Balances. • Cost basis. Book Values. The software can recalculate premium and discount balances for current and prior periods. Or, the software can preserve your current premium and discount balances. No book value, cost basis adjustments necessary. Try the free demo available on the Price page, below. See how easy it is to amortize your own premium and discounts. • View results. Print results. Any year. Fiscal. Calendar. Or range of months such as a quarter. • CPA and accounting firms. Financial advisors. When working with the year 2016, you can exclude the 2017 bonds from calculations and view. Monthly. Quarterly. Range of months. Calendar and fiscal year totals. Current period. Prior periods. Future periods. Retain current cost basis, book value. Convert existing bonds and balances with no journal adjustments. and provide totals by/for any purpose. = NET for any Month. Quarter. Calendar or fiscal year. Go back in time. Go forward in time. • MBS, GNMAs, syndicated packages, LSBO, secondary market, grouped originations, bundled loans, bonds with monthly par reductions and more. • NET report - what did you earn on your portfolio? - Have the software recalculate premium and discount amortization from Begin dates. Export calculation results and reports to Excel, other spreadsheet. Export reports to a worksheet. Or save bond worksheets with a unique monthly name. • Go back in time. Go forward in time.